What is Big Data Analytics ? How is it related to user experience, business decision making… ? How much big is BIG? What about real-time analytics ? First of all, it’s not as if I was totally out of date, the buzzword, concept or whatever is still pretty new – that’s a relief! As you can see below “big data analytics” searches and interest is still growing over time and appeared approximately one year ago. However it would not be accurate to say that it’s a new concept, it’s more like a reaction to how we treat and receive information nowadays compared to few years before. Technology and Digital media’s evolution enabled a lot of new possibilities and Big Data analytics is addressing them. Professional, Analyst or IT people will speak about Big Data analytics when there is too much data to analyze them in a standard way and that you don’t even know how much of those data are useful or not, when there is so much various data sources that it’s becoming really complex to be able to get useful insight from them and finally when your business requires to be listening to your customer in a more immediate way. In summary 3 components: Variety, Velocity and Volume (I’ll come back to this 3 keywords later on this post). From a Business oriented point of view, Big Data Analytics is today a necessity for companies which have access to a tremendous amount of information about their prospect/client/customer… but do not take advantage of it because they are overwhelmed by those data. Today most companies will try to understand those data but at-rest, they will produce reports quarterly or monthly and rely on those reports to adjust their marketing mix / communication towards their customers. It’s always good to look backward to take decision but it’s even better to take a decision looking backward and forward. Twitter data source is one of the best example to illustrate how powerful Big Data Analytics can be: you can’t be listening to your customer sentiment 3 months after the launch of a new product and considering the amount of tweets it could represent your datawarehouse would not support that. So you would take 20% of those data and analyze them 1 month or so after – which has to be done. But you could also, analyze in real time how your customer sentiment towards this supposed launch is trending. as long as they can be stored on a computer and “digitalized”: Facebook status, tweets, images, camera feeds, credit-card transactions, consumer purchasing histories, climate information, GPS location etc. , and that’s where you can and would take advantage of it: the more quickly you can see a threat, analyze an information about your customer, detect a new trend, the better you can make a competitive advantage of it. , which is imported into databases estimated to contain more than 2.5 petabytes of data). And now technology enable us to stop sampling to analyze data and use every data we have! Big Data is the answer! But what’s the question? ” elaborate on advantage of both Small Data Analytics & Big Data Analytics : 2 complementary disciplines (p8 & 9). Big Data Analytics is often referred as a challenge for company & analyst. Indeed, it’s a pretty huge challenge to be able to dig out relevant insights within enormously huge amount of data available and . – Big Data University: it’s indeed promoted by IBM but there is a lot of stuff very interesting to get a first impression of what is Big Data & you can even get a nice certificate if you take some online courses. Feel free to share your thought, freebies and else! Few weeks ago, I have been questioned about my process & habits when confronted to analyse a social media campaign – a viral video campaign to be more specific. I never tried to put this out on a paper before, but here it is! Sure, I’m not the first to write about this as I found out when surfing. 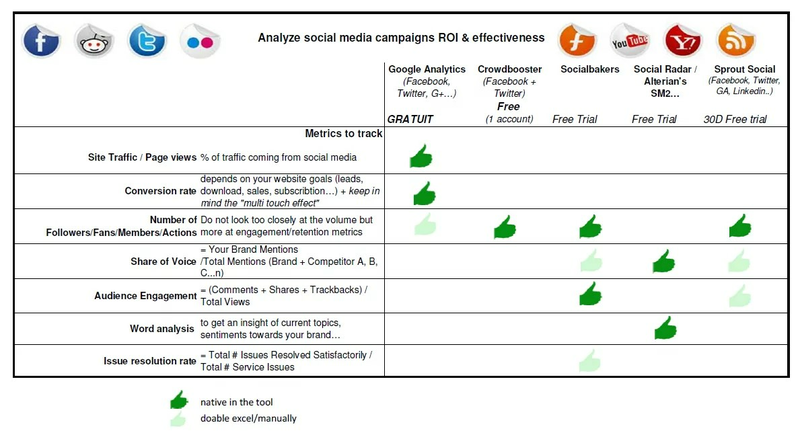 Here are 2 sources I found deeply interesting: Avinash post about social media metrics & the report from Web analytics demystified & Altimeter. 1. 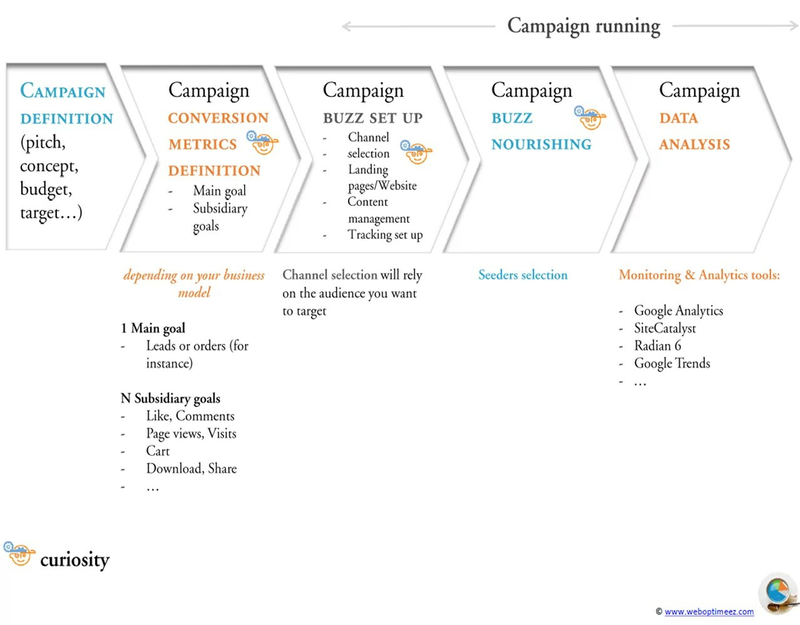 If I do not want to miss any factors and fully evaluate the success of my campaign, the customer journey: “Reach, Acquisition, Conversion & Retention” is the natural and more accurate path to follow. 2. What kind of questions I want to be able to answer to? 3. And from that point, Define my metrics & KPI. The questions above are social campaign oriented but the sections could be used for any digital campaign for my point of view. Does it reach an audience and convey satisfaction? Reach is your ability to catch visitors attention. Were you able to reach anyone, catch their attention? This could be also how much awareness did you arise. Did you create a real interest for them? Does it convey the Key messages to the targeted audience? Acquisition is the logical step behind Reach. When you reached those visitors, did you caught their attention enough to stay and look further, get them to land on the page you were expecting them to. Did you get the right audience, the one you were targeting? You will use a list of metrics for this section but most importantly you need to segment to be able to measure success on this step! 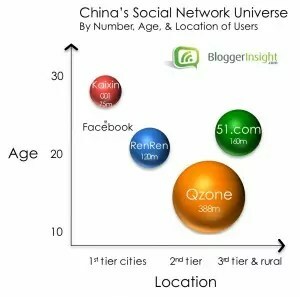 – bounce rate, time spent, page views per visits, returning visits… > breakdown per social media channel & per target. Does it go viral & trigger actions? – conversion rate, number of share/like/comment… > breakdown per social media channel & per target. Was it worth it? | Will it engage user over time? Finally, you will want to know: how is the ROI of your campaign? Did that campaign bring you new users that will stay, existing clients that will engage more, did you gain in SEO… ? You will want to track this overtime as the effect of your campaign will hopefully stay overtime. With these 4 sections, I think we will be covering the most of it. What’s your thoughts on this? Do you use another methodology for this?